Here is an in-depth look at the six candidates the Cleveland Browns have interviewed for their head-coaching vacancy. 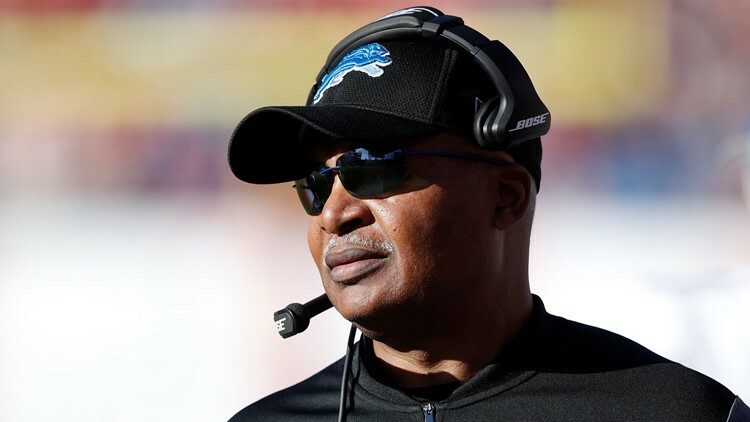 The Cleveland Browns are one week into their official search to fill their head-coaching vacancy, and they have put in plenty of time with perspective candidates. From former head coaches (Gregg Williams, Jim Caldwell, Dan Campbell) to top coordinators (Williams, Brian Flores, Kevin Stefanski and Matt Eberflus), the Browns have interviewed six candidates with various amounts of NFL coaching experience, and reportedly are scheduled to bring in at least two more prospective coaches this week. Here is a ranking of the candidates in terms of who I would most want to coach the Browns in 2019 and beyond. 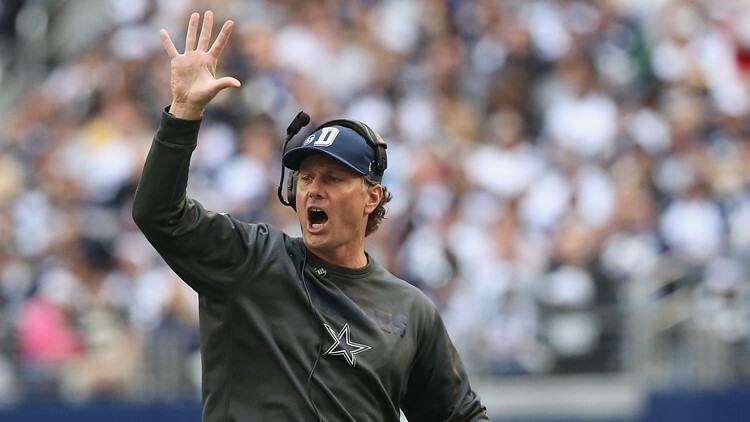 Former Dallas Cowboys linebackers coach Matt Eberflus is one of six candidates interviewed for the Cleveland Browns' head-coaching vacancy. Eberflus has a connection with the Browns, as he served as their linebackers coach in Cleveland during Eric Mangini’s two-year stint as head coach (2009-2010), but he does not have a lot of experience leading one side of the ball. Eberflus, a native of Toledo and former assistant coach with the Rockets, is a first-year defensive coordinator for the Colts, who got improved play out of that side of the ball this season, but if the Browns want to take a risk on a short-term play-caller as their next head coach, staying in-house with Freddie Kitchens might make more sense. Minnesota Vikings interim offensive coordinator Kevin Stefanski looks on as quarterback Kirk Cousins (8) warms up before the game against the Miami Dolphins at U.S. Bank Stadium in Minneapolis, Minnesota on December 16, 2018. Much like Kitchens, Stefanski received a mid-season promotion with his elevation to interim offensive coordinator. Stefanski is a long-time NFL assistant with the Vikings, where he most recently served as a replacement play-caller after previously mentoring the quarterbacks, running backs and tight ends in 13 seasons with the club. 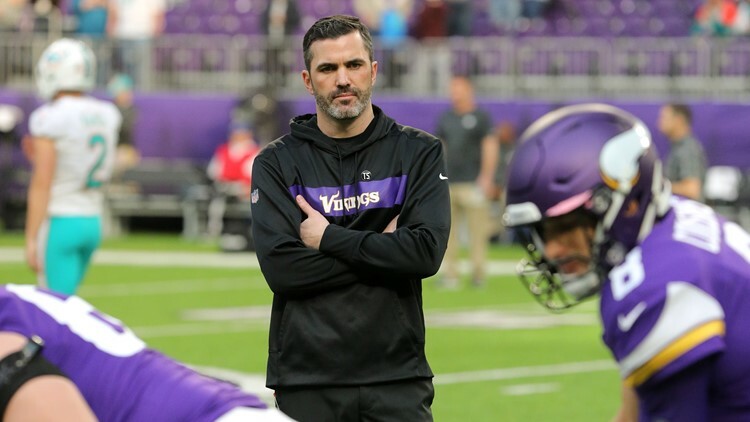 The Vikings’ longest-tenured assistant coach, Stefanski replaced former Browns assistant coach John DeFilippo as Minnesota’s offensive coordinator late in the 2018 regular season. Stefanski has helped the Vikings to a 107-99-2 record during his 13 years in Minnesota. Since Stefanski arrived in 2006, the Vikings have made five trips to the postseason, including two appearances in the NFC Championship Game and brought home four NFC North Division championships. With Stefanski on staff, the Vikings have won 10 or more games five times, including the second-best finish in franchise history. The 2017 Vikings posted a 13-3 record, which ranks second only to the 15-1 mark set by the 1998 team. 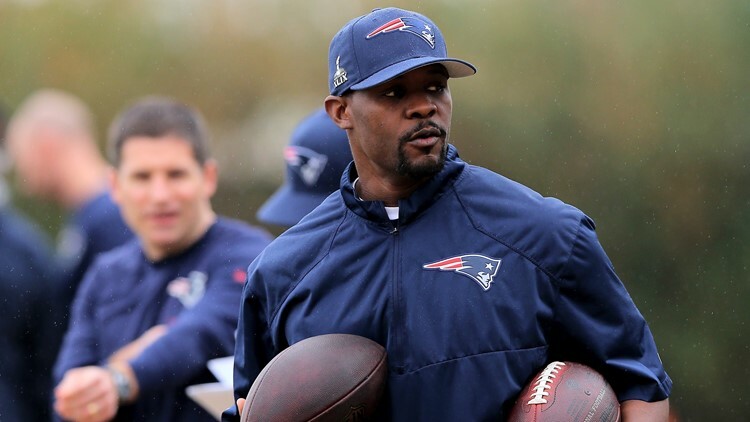 Safeties coach Brian Flores gets ready for drills during the New England Patriots' Super Bowl XLIX practice at the Arizona Cardinals Practice Facility in Tempe, Arizona on January 30, 2015. The sample size for Flores as a play-caller is limited despite his having nearly a dozen years of coaching experience at the NFL level, all of which have come in New England. Currently, Flores is serving as de-facto defensive coordinator for the Patriots while also handling the dual role of linebackers coach. While not holding the official title of defensive coordinator, Flores has handled the play-calling duties for the Patriots, who won their 10th straight AFC East Division Championship and clinched the No. 2 seed in the AFC. Flores began his NFL career as a scouting assistant with the Patriots (2004-2005) and moved up to pro scout (2006-2007) before getting involved in coaching. During the 2008 and 2009 seasons, Flores was a special-teams assistant, and in 2010, added offensive assistant to his responsibilities with the coverage and return units. In 2011, Flores transitioned to defensive assistant, and then, spent four years as the Patriots’ secondary coach (2012-2015). Prior to the 2016 season, Flores was elevated to linebackers coach. 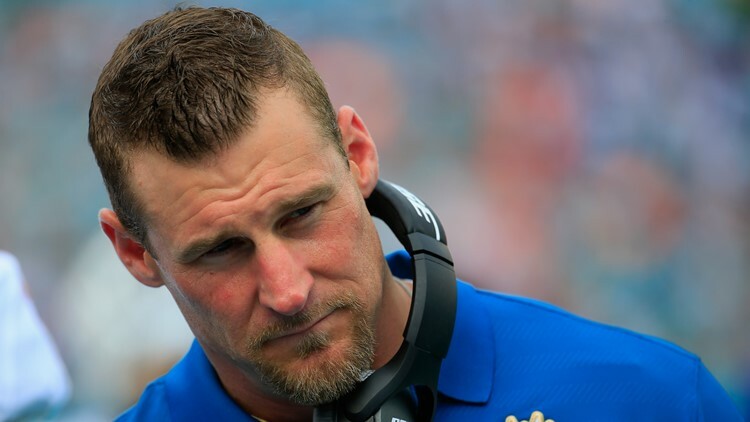 Miami Dolphins interim coach Dan Campbell looks on during a game against the Baltimore Ravens at Sun Life Stadium in Miami Gardens, Florida on December 6, 2015. Campbell has nearly 20 years of experience at the NFL level, 11 as a player for the New York Giants (1999-2002), Dallas Cowboys (2003-2005), Detroit Lions (2006-2008) and Saints (2009), and eight as a coach for the Miami Dolphins (2010-2015) and Saints (2016 to present). Most importantly, Campbell served as an interim head coach before and had success, particularly in the run game. Campbell started his post-playing career as Miami’s tight ends coach and served as the interim head coach for the final 12 games of the 2015 season. During that time, Campbell led the Dolphins to a 5-7 record, including a 20-10 win over the New England Patriots in the season finale. Under Campbell’s guidance, the Dolphins drastically improved their run game, moving up eight spots in the rankings in NFL rushing yards per game. Lamar Miller gained 741 of his 872 yards running the ball and all eight of his rushing touchdowns. Miller finished the 2015 season with 1,269 total offensive yards and 10 touchdowns, and quarterback Ryan Tannehill became the first Dolphins player to throw for at least 4,000 yards in back-to-back seasons since Hall of Fame signal-caller Dan Marino accomplished the feat from 1984-1986. Five Dolphins earned Pro Bowl invitations in 2015, including current Browns receiver Jarvis Landry. Since joining the Saints, Campbell has made the tight ends a key component of New Orleans’ high-flying offense. 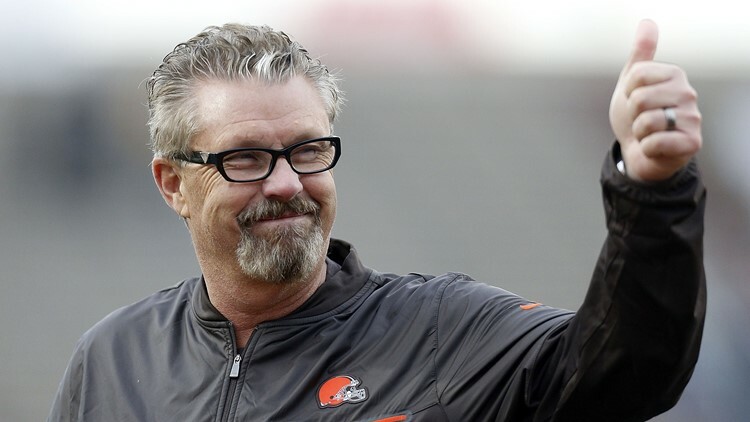 Cleveland Browns defensive coordinator Gregg Williams reacts after the Reese's Senior Bowl at the Ladd-Peebles Stadium in Mobile, Alabama on January 28, 2017. Sometimes, the best option is the one staring somebody right in the face. At 2-5-1 following a 33-18 loss to the Pittsburgh Steelers on October 28 and in the middle of an unprecedented midseason coaching staff upheaval following the dismissals of Hue Jackson and offensive coordinator Todd Haley with eight games left to play, the 2018 Browns looked to be anything but a team capable of the greatest year-to-year turnaround in franchise history. But a 5-3 record over the second half of the season and a three-game winning streak in December secured the Browns’ greatest turnaround in team history, as they finished plus-7.5 in wins over last year’s winless campaign. With a 26-18 victory over the Cincinnati Bengals at FirstEnergy Stadium on December 23, the Browns finished off their first regular-season sweep of an AFC North Division opponent since 2002. In addition to breaking a 16-year drought of two wins in the same season against the Bengals, the Browns finished the home portion of the schedule without a loss against an AFC North Division opponent for the first time ever.